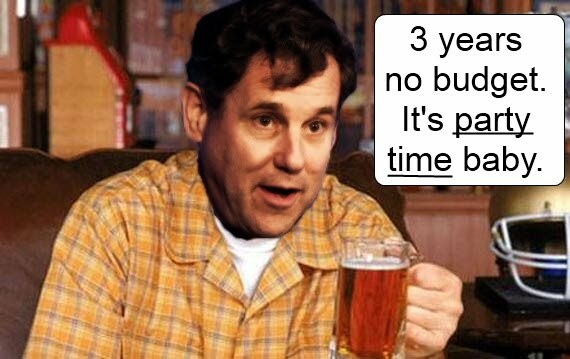 How much debt has Sherrod Brown put on you? So if Sherrod calls an extra $1000 on a loan that someone voluntarily borrows “oppressive debt”, what does he call the mountain of debt he and President Downgrade are piling on everyone’s shoulders, without our consent? What kind of debt are we talking about? When Sherrod Brown took office on January 3rd, 2007, the national debt was $8.7 trillion. Today, it stands at $15.7 trillion. Since he has been in the Senate, he has increased the national debt by $7 trillion. Sherrod has added over $23,000 for every man, woman and child in America in under 5 1/2 years. Debt that we didn’t ask for, unlike taking out a student loan. And he DARES to call $1000 “oppressive”?? The failed joke of a “stimulus” that he voted for? That alone cost every person in America $3000! And he wants us to get worked up over $1000? Sherrod Brown actually talks about “fiscal responsibility” on his website. His idea of responsibility begins with blaming George Bush and ends with claiming that Obamacare is going to reduce the deficit. In fact, Sherrod is so fiscally responsible, that he and his Senate Democrats have refused to pass a budget in over three years. The next time you see Sherrod Brown tweet about #dontdoublemyrate, remind him that his votes and his spending record are costing each and every one of us several times more than the student loan interest he is whining about.